Disney Junior’s newest hit animated TV series geared to kids ages 2-7, “Doc McStuffins,” will be available for the first time ever on Disney DVD and Digital Copy, August 21, 2012. Sure to become a fan favorite with parents and kids alike, “Doc McStuffins: Friendship Is The Best Medicine” includes a DVD featuring five full length episodes, each consisting of two 11-minute stories, a Digital Copy of the episodes – perfect for kids to watch anytime, anywhere – and also comes packaged with Doc’s special Big Book of Boo-Boos with fun activities plus character and boo-boo bandage stickers. The characters and themes featured in “Doc McStuffins” are all made to be relatable to young viewers and are designed to ease kids’ trepidations about everything from a doctor’s visit to removing a splinter. Many of the stories directly address the kinds of issues that parents face with their young children when it comes to good health, hygiene and trips to the doctor’s office. It’s the perfect series to have on-hand and add to your home entertainment collection. The lovable characters in the series are voiced by Kiara Muhammad as Doc; Loretta Devine as Hallie; Lara Jill Miller as Lambie; Robbie Rist as Stuffy; Jess Harnell as Chilly; Jaden Betts as Donny McStuffins; Kim Brooks as Mom McStuffins; and Gary Anthony Williams as Dad McStuffins. The series’ theme song is performed by the star of Disney Channel’s hit series “A.N.T. Farm” and Hollywood Records recording artist, China Anne McClain. Created and executive-produced by Humanitas Prize and Emmy® Award-winning Chris Nee (writer on “Little Bill” and producer of “Deadliest Catch: Crab Fishing in Alaska”) and directed by Emmy® Award-winning Norton Virgien (“Rugrats”), “Doc McStuffins” is a production of Academy Award® nominated Brown Bag Films (Best Animated Short Film “Granny O’Grimm’s Sleeping Beauty” in 2010) in association with Disney Channel. The Hollywood Health & Society division of the USC Annenberg Norman Lear Center serves as the series’ health and medical consultants, advising on basic health issues that are relevant to young kids and families. · ENGINE NINE, FEELIN’ FINE! – Doc and her toys learn a lesson about dehydration after discovering that Donny’s toy fire engine has run out of water. · THE RIGHT STUFF – Stuffy rips his tail and tries to hide it from Doc and the other toys and learns that anyone can get hurt – even brave dragons. · CAUGHT BLUE-HANDED – When a mysterious rash of blue spots breaks out among some of the toys in the clinic, Doc traces the “Mystery Pox” back to Donny’s toy monster, Glo-Bo who had been finger-painting earlier in the day and forgot to wash his hands. Glo-Bo is voiced by Jim Belushi. · BEN/ANNA SPLIT! – When Doc’s huggy monkey doll Ben loses the velcro patch that attaches him to his sister Anna, Doc glues it back on and tells him that he will have to stay in the clinic overnight while it dries. · THAT’S JUST CLAW-FUL – Doc prescribes physical therapy for her crab bath toy Hermie after she reattaches one of his claws that has fallen off. · THE RIP HEARD ROUND THE WORLD – While dancing with Lambie, Doc accidentally rips a hole in her fur. · WALKIE-TALKIE TIME – Doc diagnoses a toy walkie-talkie with “Staticosis” and helps find his missing antenna so he can communicate clearly again. · HALLIE GETS AN EARFUL – When Hallie is having trouble hearing, Doc gives her a hearing test and realizes that she has extra cotton stuck in her ears. When we received this DVD a couple of weeks ago, my daughter couldn’t wait to watch it with her two best cousins. We just so happened to be going to stay at my parents lake property the same weekend, so I decided to bring along this DVD as well as a few other treats that we received with the movie. These fun items included a tea party set, an apron, the movie and a gift card to buy a few treats for the kids. The resort had a picnic table which the kids set up their glasses and plates on top of. For the snacks the kids had chocolate chip cookies and fruit juice. I was suprised to see how well all of the girls played together considering they are all under 5, but their is something special about tea parties and girls. After the party we all went inside and I set up the DVD player so the girls could watch Doc McStuffins, they all were so excited! The ages of my daughter and neices range from 2-41/2 which is a great age for this show. The entire DVD runs for almost 2 hours and while they didnt’ sit and watch all of the episodes in one sitting, they did manage to see teh whole DVD over the weekend. I really love this show and think it’s a great addition to the Disney Junior lineup. 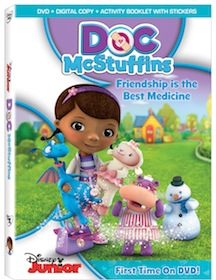 Doc McStuffins: Friendship is Medicine DVD is now available in stores and online. If your looking for some fun activities for your kids be sure to print out these free Doc McStuffins Activity sheets to keep them busy and entertained. *I received a party pack that included this DVD in exchange for my honest review. All opinions expressed are my own. this show is just too cute. My kids love this show. I think it helps them understand why we go to the dr’s.